6. 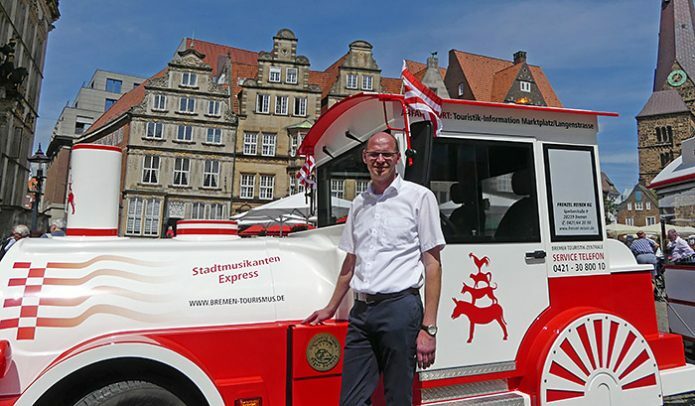 Juli 2017 Ingrid KrauseVisit BremenMini-Bus-Tour, Minibus..
Bremen is the proud owner of a brand new road train, the Stadtmusikanten Express (named after the Bremen Town Musicians). 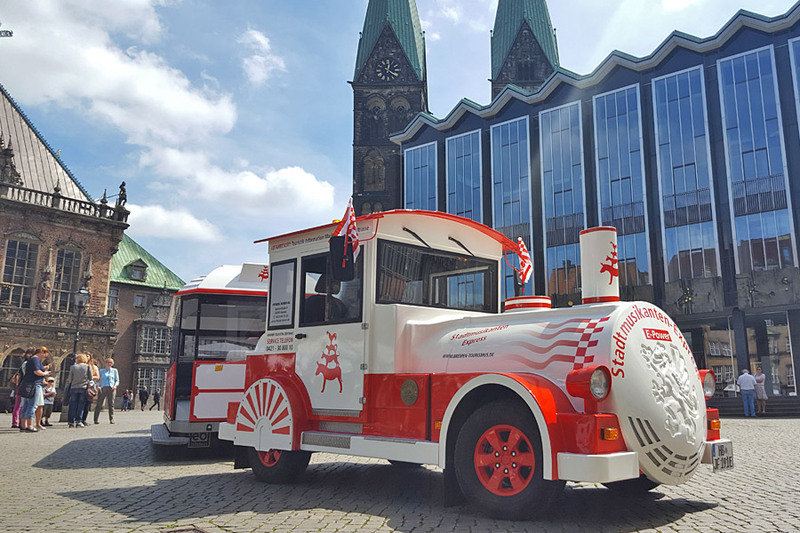 Now that our minibus Emma has gone into retirement, this cute little train will be taking guests on tours of the city centre. Passengers are treated to a fantastic overview of the city’s finest sights and the main quarters. 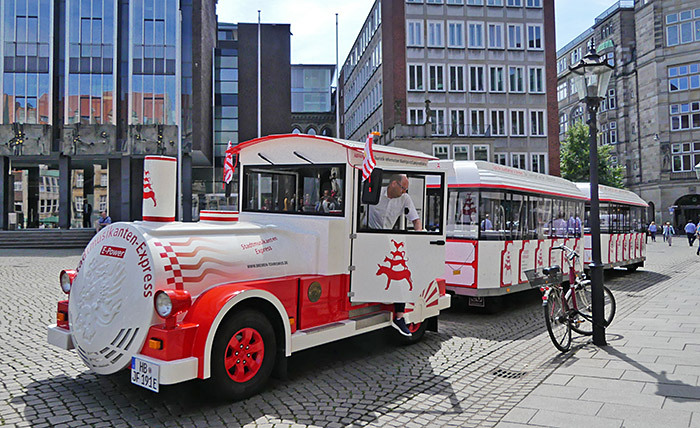 The train operator, Jörn Frenzel, tells us this is the all-weather model. The extra protection was not necessary today though. 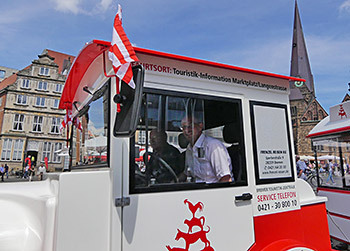 With the sun shining down on them, Ekkehart Siering, State Councillor for the Department of Economics, Jörn Frenzel and my boss, Peter Siemering, climbed aboard for the maiden voyage across the market square. Smile and handshakes – again, please! When does the train leave??? All aboard! The test drive gets under way. 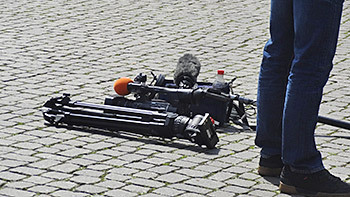 What on earth is he filming there? 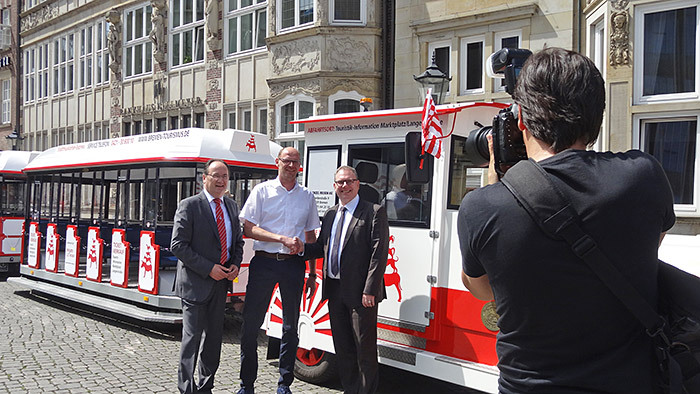 Hailed by Frenzel as a ‘revolution in the sightseeing train sector’, this new vehicle has more seats than its predecessor and it was made in Germany. It’s also quiet and environmentally friendly. 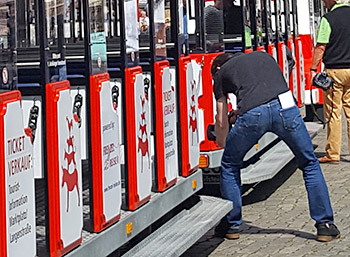 Here comes the science bit: the locomotive has a synchronous electric motor with an output of 60 kilowatts, a range of 150 kilometres, two trailers, each with 24 seats, and a top speed of 25 kilometres per hour. To begin with, those waiting on the market square had little interest in the facts and figures. They were simply looking forward to the big unveiling under blue skies, and were delighted that there was finally a successor to ‘Emma’. But as soon as they spoke to the driver, they wanted to find out more. Brilliant. Everybody was happy. And they still are. I have to confess, when I’ve been on holiday myself, I’ve never hopped aboard one of these ‘tourist runabouts’. I prefer to discover cities on foot, and so I have no point of comparison. But the train is just the answer for kids or grandparents whose legs won’t last all day, or anyone who could do with a rest. 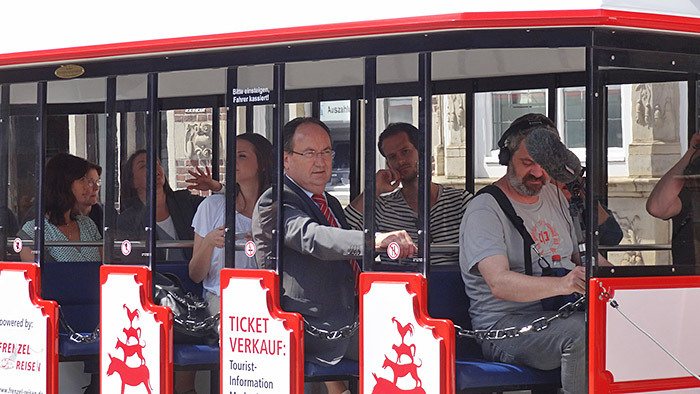 In fact, it just makes a fun way to discover the city, soaking up information and listening to anecdotes. I hugely enjoyed my test drive. I’ll definitely have to come back for the full tour. Then I’ll get to hear the train’s little bell in action. Or does it have a horn instead? Today, everything was so blissfully quiet that I hardly heard a thing. The whole project was finished bang on schedule. It’s unbelievable how many licences and approvals are needed for something like this. There’s even a separate licence for transporting passengers in the trailer. I don’t think anybody would have known that when the project began, but the local authorities were a great help. After all, they didn’t make the laws. 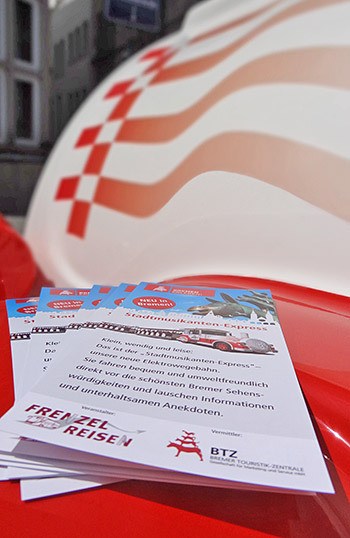 You could see the relief on Jörn Frenzel’s face that everything had come together in the end. 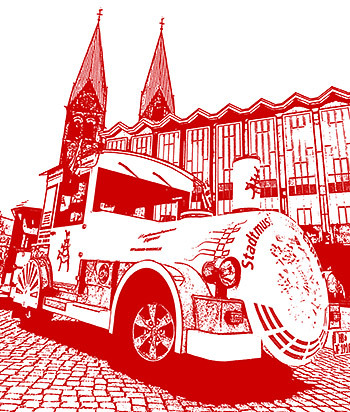 City centre or Überseestadt? Or both? 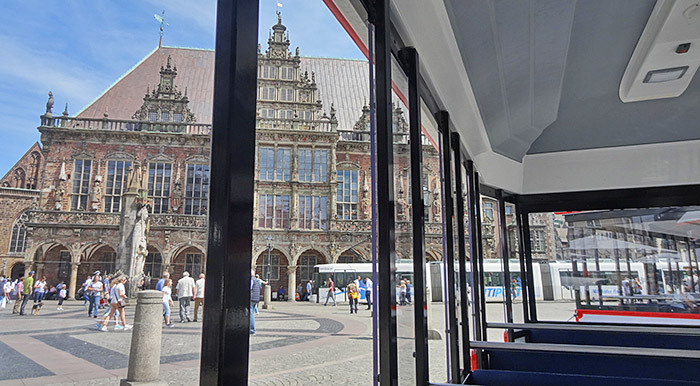 Train route one goes through the city centre, getting up close to Bremen’s most important sights. 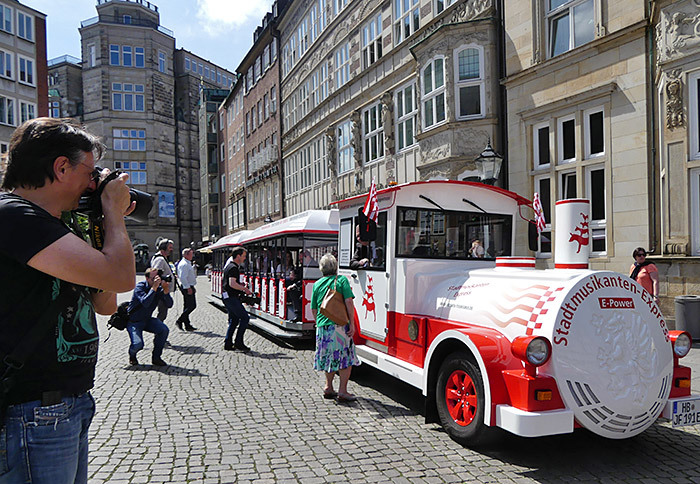 The train also has special dispensation to drive across the market square, enabling passengers to get right in the thick of it. The route continues to Schlachte Embankment, Wall, the Schnoor quarter and the cultural mile/Viertel quarter. 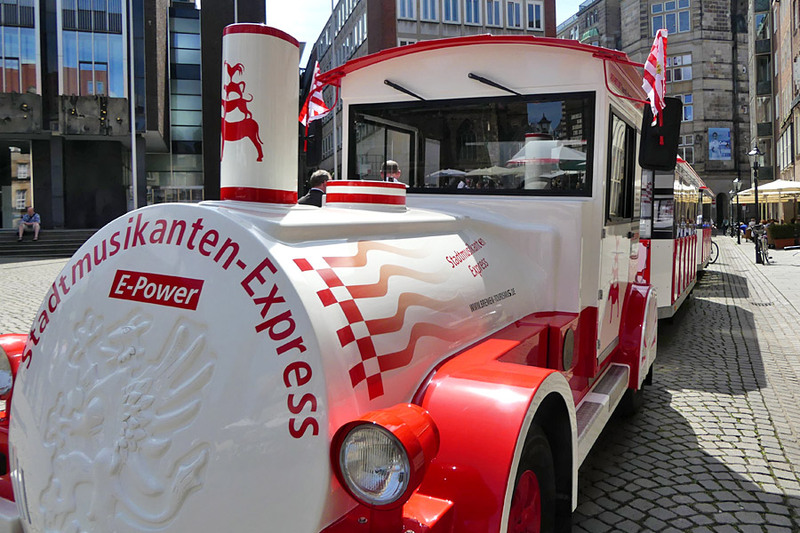 Starting at 10.30am, this train runs several times daily until the end of October, and then again during the Christmas market. 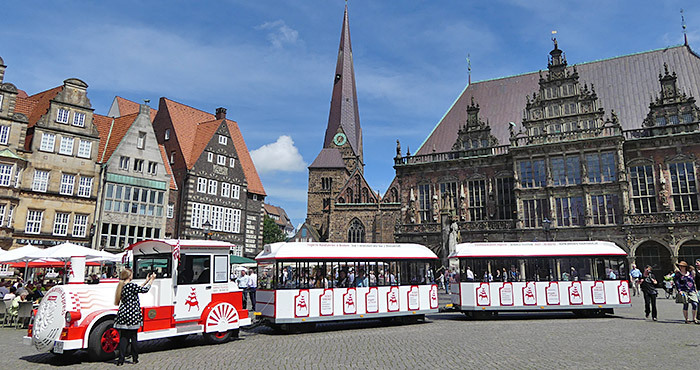 Train route two goes along the Weser and into Überseestadt, where passengers can see how the old dockyards have been transformed into a vibrant new harbour district. This train departs at 1.30pm. 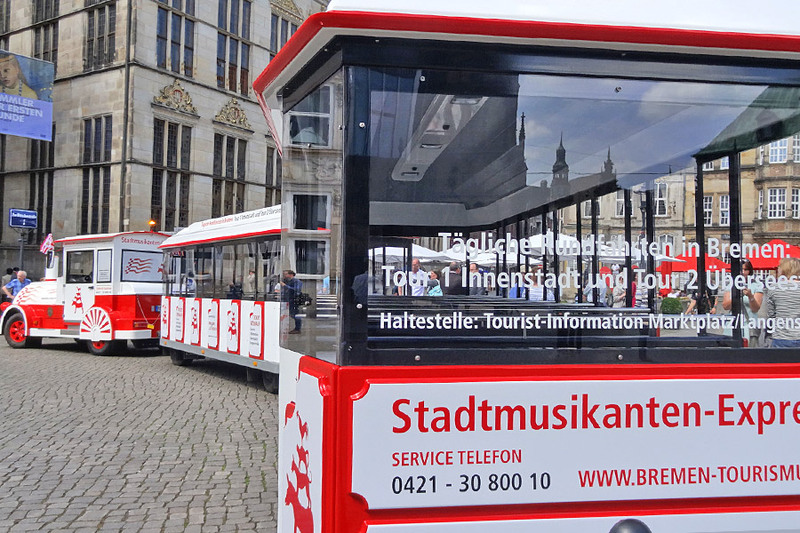 Both routes depart from the tourist information office on the market square (on the corner of Langenstrasse). 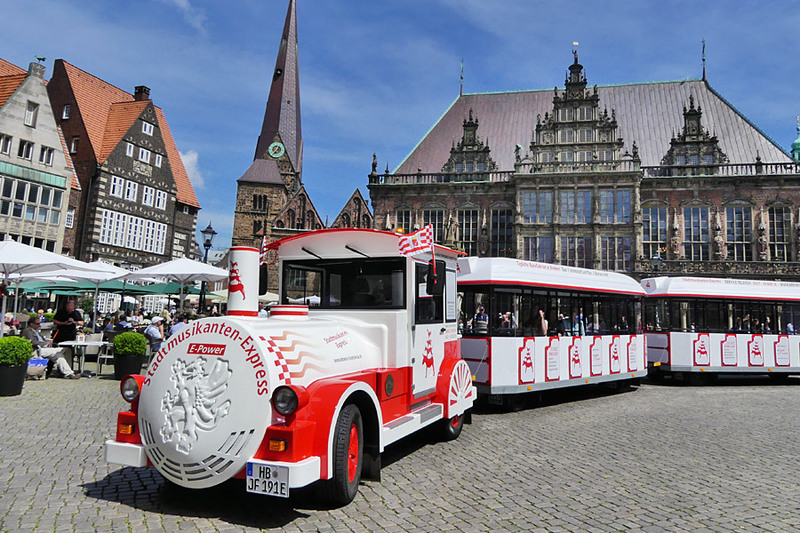 For more detailed information on times and prices or to book your ticket, visit bremen-tourismus.de/express, call us on +49 (0)421 30 800 10 or come and see us in the tourist information offices. And to finish off, just a few more pictures to make sure every angle is covered. The train is just so beautiful that I fell in love with it instantly. See if you agree, and book your tickets today!